We are all running in a race. Some are racing towards certain destruction; others are racing towards a glorified body and a life in paradise. We who have accepted the atoning work of Christ have already attained Heaven. He gave eternal life to us freely. We have it right now! However, we still have a race to run. There is a finish line. Paul isn’t being double minded in our verses from Philippians. When he says that he hasn’t already attained, he is referring to the finish line. The attainment we have already is the finished work of Christ. We know He already ran this race and the wonderful news (the Gospel) is that He won! He ran this “track” before we ever even put on our running shoes. Not only did He run the race He removed the hurdles and the stones. He laid the path straight. A leader always “goes there first” and Jesus was the ultimate leader. If you get lost just go back to the spot where you left your lane on the track, and step back in line, take a deep breath and run. Follow those who follow Christ. If Jesus has cleared our path, why do we stumble and even sometimes come crashing down with the road rash to prove our failures? Think of it this way. Jesus removed the obstacles in our way, it’s done. Picture a bowling alley. There is a device that sweeps away the pins that have fallen before every frame, clearing the way for a potential strike. Now, picture that track. Jesus cleared it, yet our enemy continues to put things in our path to distract us and cause us to get off track. All we need to do is use the authority Jesus already gave us and push the “clear” button to sweep those things off of our lane. Sometimes we lack faith and we either run smack dab into those hurdles or we think we can just go around them. The consequences can be rough. Sometimes it takes some skinned knees to get us to admit we weren’t allowing His Spirit to lead us, or we forgot that His word lights our path. It’s not the end of the race! We get up, realign ourselves by focusing on God and repent from our lack of faith, and begin again. I love the fact that in this race there isn’t only one winner. It isn’t the fastest runner who wins. All we have to do is finish the race. You might be the last one who crosses that finish line, but that doesn’t mean your prize is any less than the first person who crossed (Jesus Himself). 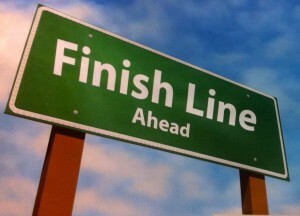 Sometimes I get discouraged when I think that finish line is so far away. I feel like I have run a marathon, but looking back it was the fifty yard dash, or worse yet I was only on my treadmill and didn’t move a foot. Thankfully the Holy Spirit faithfully reminds me of the truth: Christ already ran the race and won, so we are really just taking the victory lap. Then I can see that finish line and it looks right there. The path looks clear, not a pebble or a banana peel in sight. On the other side of that line…is Jesus and man is He cheering! I see some others there too. They have already finished their race, but instead of soaking in a hot tub relaxing sore muscles, they are encouraging me to run. We win. Take that victory lap! This entry was posted in Thoughts and tagged Bible, Christ, Christianity, crossing the finish line, finishing well, following Christ, God's love, Holy Spirit, hope, living for Jesus, running, running a race, transformed life, winning, winning the prize.